THIS IS 40. Here's some time tested proof that life is not over at forty. The forties come in a variety of colors, shapes and sizes. Find the one that's right for you. This is the third in the series presenting the incredible range of style loving women over forty. This one comes with a cute Dutch accent, and very practical advice about style in your forties. 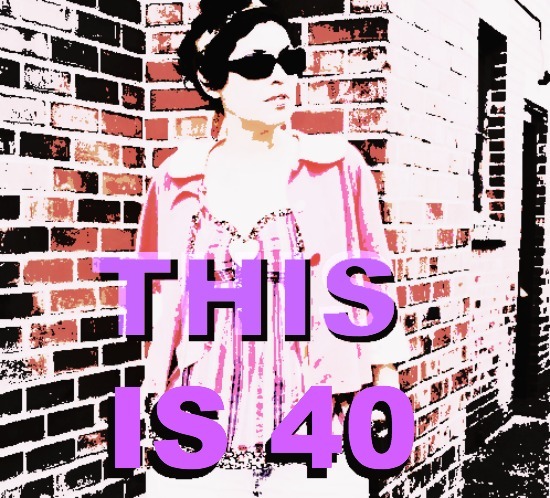 Meet Sylvia, maven of 40+ style for the +40 crowd. You've been sharing your own style journey with your readers for a few years now, as well as starting much dialogue about +40 style. What have you discovered is the biggest concern for women over 40 in regards to their own personal style? I think one of the main concerns for many women over 40 is to dress for their changing body. They may have gained weight and feel that nothing looks good anymore and they may give up on dressing nicely. Once they discover that they need different clothes and that they can still look amazing, it makes a huge difference. Has blogging affected your own personal style? Perhaps I'm making even more of an effort, although I have always had a desire to dress up nicely. I'm also thinking more of why I and how I combine things, so I can explain it better to my readers. That in itself gives me new ideas as well. "Choose only those clothes that either flatter you or make you happy." How are you different in terms of dress, than you were in your 20's, and 30's? I use more color now and wear heels. I think I have become even more adventurous with clothes now and know better what I like and what my style is. I also care less about what others think and dress to please myself. What would you say is difference in the way a woman dresses once she's in her forties? I think you should stick to your own style as much as possible when you hit 40 and beyond. You don't want to lose your personality. I believe in creating a great silhouette and dressing to your body's strengths. I think that becomes even more important after 40. I also think she should use more color close to her face, as our skin tone tends to become a bit duller and paler. What are 3 key pieces in a wardrobe that every woman should have? Some hip and modern shoes. What advice would you give your 30 year old self in regards to dressing? Have a bit more fun with it, be yourself and use more color. What advice would you give to other women +40 and beyond in regards to dressing? Try something new and experiment with colour and silhouette. Choose only those clothes that either flatter you or make you happy. Use the power of accessories and shoes to really add a modern vibe or color to your outfit. Most of all have fun! What are 2 fashion resources you can't live without? The many blogs I follow and street-style inspiration. Do you have any favorite blogs that you read almost daily? I read so many through my Reeder app and I like them all, but a few favorite fashion blogs include No Fear of Fashion, The Style Confessions, the Style Crone and yours of course Bella. How do you feel about dressing in a way that is "age appropriate" ? I think that the most important thing is that you dress 'you' appropriate. Age appropriate is different for every woman. It's important to stay true to yourself as much as possible. For myself, I now feel better when my skirts are a bit longer and my clothes are a bit dressier. But I always add a 'young and hip' element to my outfit as well, either with accessories, shoes or a special detail in my clothes. It's about creating a pleasant picture that highlights all your strengths. What would you say the main message of 40+ Style is? The main message of my site is to have fun with dressing and style. I believe in the saying that if you look good, you often feel good as well. This is brilliant! I love Sylvia. She is astute and kind and inspiring. And I love her aesthetic; I wish I were as svelte as she so I can pull off those asymmetric looks she often rocks. Phenomenal!! Sylvia is brilliant and beautiful!! Great interview! I love seeing more of the personal side of Sylvia. Oh, what fabulous style! I didn't know Sylvia before, so thank you for featuring this awesome woman, Bella! Sylvia is an amazing woman - she is a visionary. It is her and you, Bella, I have to thank for finding so many wonderful 40+ style bloggers. That's where it all began for me. Before I found Sylvia's and your blog (Into The Violet, I mean), I had no clue - I believed that the only style bloggers were young charming girls. And myself :))) - just turned 40 and clueless about style, as just like Sylvia mentioned here, I found my body dramatically changed and my ideas about style outdated. Sylvia's style is very unique, happy and modern. I adore the first photo - so dreamy! And I love Sylvia's red glasses, they always pop! Thanks for the lovely interview and the honor of featuring me on your fabulous site Bella! Love this - thanks Bella for helping us see more of Sylvia. I think she's brilliant. Wow, what great style she has. And smart things to say, too. I hope I can be half as stylish as all you wonderful women when I reach the other side of forty! Thanks for featuring Sylvia! Her taste is impeccable and she is definitely a big influence on the 40+ fashion community.